Director – Jonathan Frakes, Screenplay – Michael Piller, Story – Michael Piller & Rick Berman, Producer – Rick Berman, Photography – Matthew F. Leonetti, Music – Jerry Goldsmith, Visual Effects Supervisor – Jim Rygiel, Visual Effects – Blue Sky/VIFX, POP Film and POP Animation (Supervisor – David Sosalla) & Santa Barbara Studios, Special Effects Supervisor – Terry Frazee, Makeup Effects – Michael Westmore, Production Design – Herman Zimmerman. Production Company – Paramount. 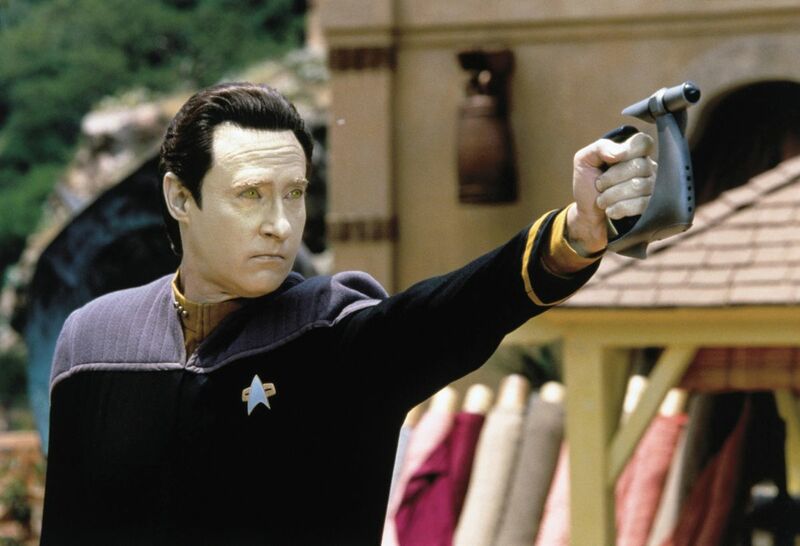 Data the android suddenly goes amok and attacks a hidden Federation anthropological observation post on the world of the peaceful Ba’ku. Captain Picard and The Enterprise crew are brought in by Admiral Dougherty to stop him. Trying to discover the reasons for Data’s malfunction, Picard discovers a holographic ship hidden in a lake and realises that Dougherty, in collaboration with the ruthless Son’a race, is planning to secretly transport the Ba’ku off the planet without their being aware of it. As Picard becomes involved with the Ba’ku woman Anij, he and the crew discover that the metaphasic radiation from the planet’s rings provides a natural rejuvenating effect and that each of the Ba’ku is over three hundred years old. They realise that Dougherty and the Son’a want to exploit this resource for their own benefit. The only choice is for Picard and The Enterprise bridge crew to disobey Dougherty’s direct orders and form an insurrection to protect the defenceless Ba’ku. There is a certain superstition amongst Trekkers that odd numbered Star Trek films will always be a disappointment, with Star Trek’s I, III, V, VI all having been flops or disappointments of one sort or another. (It is not a belief this author entirely agrees with – Star Trek – The Motion Picture (1979) is a underrated film and the even numbered The Voyage Home: Star Trek IV (1986) is an overrated effort that panders far too much to fan indulgence). Star Trek IX, Insurrection, starts out exceedingly well with an arresting preamble that leaves you wondering exactly what is going on – a Federation post tracking the movement of otherwise invisible people through a peaceful village via heat sensor; an invisible person running through the township, knocking and causing people to fall; Data’s head appearing out of nowhere as he strips off his invisibility suit then turns and fires on the observation post, causing it to appear out of thin air. It is an attention-grabbing opening to the film and shows immense promise for what is to come. Unfortunately, little else in the film is ever so dramatically intriguing and thereafter Star Trek: Insurrection conforms to what Star Trek lore’s numerological superstitions have predicted for it. Certainly, Insurrection is a better Next Generation film than Star Trek: Generations (1994) was, but not as good a one as the preceding entry Star Trek: First Contact (1996). Star Trek: Insurrection was Jonathan Frakes’s second Star Trek outing as director, after his debut with Star Trek: First Contact. Frakes seems to have borrowed a page from Leonard Nimoy’s directorial outings on the classic Star Trek films and has structured the film to allow each of the series regulars an ensemble part. Unlike Nimoy, who gave each of the regulars a comic set-piece, Frakes diverts a more substantial subplot in the direction of each (with the exception of Gates McFadden who barely appears on screen at all). Thus Captain Picard gets a romance; Commander Riker gets it back on with Counselor Troi again and gets to shave his beard; Data gets lessons in the nature of ‘fun’ from a child; Worf (whose reasons for being away from his regular cast appearances on Star Trek: Deep Space Nine (1992-9) are entirely contrived) goes through Klingon puberty again as he is rejuvenated; Geordi’s eyes are restored. However, these scenes seem obviously plotted in order to give everybody something to do and moreover are badly played. The Riker/Troi romance seems mawkish and Brent Spiner gives one of his worst performances – the scenes with he and the kid are irritatingly twee. (Notedly also, some of the regulars are starting to seem the worse for wear – both Jonathan Frakes and Brent Spiner look quite chubby, while Gates McFadden and Marina Sirtis are starting to show their age, despite the certain irony of a plot that centres around rejuvenation. Unlike the classic Star Trek cast who managed to hold up for the better part of a couple of decades, the Star Trek: The Next Generation cast are starting to show their age a mere five years out from the cancellation of the series). It is only Patrick Stewart who comes off with customary dignity throughout, he good in both the romantic scenes with the regally aloof Donna Murphy and in the action scenes at the climax. Star Trek: Insurrection is without a doubt his film. Where Star Trek: Insurrection works is in the strengths that Jonathan Frakes showed in Star Trek: First Contact – well-directed special effects set-pieces, a good sense of humour – and where the film doesn’t work is where it tends to amplify his and the previous film’s weaknesses – a lack of overall attention to story, his tendency to conduct the show as a series of set-pieces and character subplots rather than as a unified whole. Frakes’s work with the effects is expectedly excellent – beautiful background dioramas of nebulas, dazzling shots of the orbital Collector station spreading its solar sails, an exciting sequence with The Enterprise dumping its warpcore. 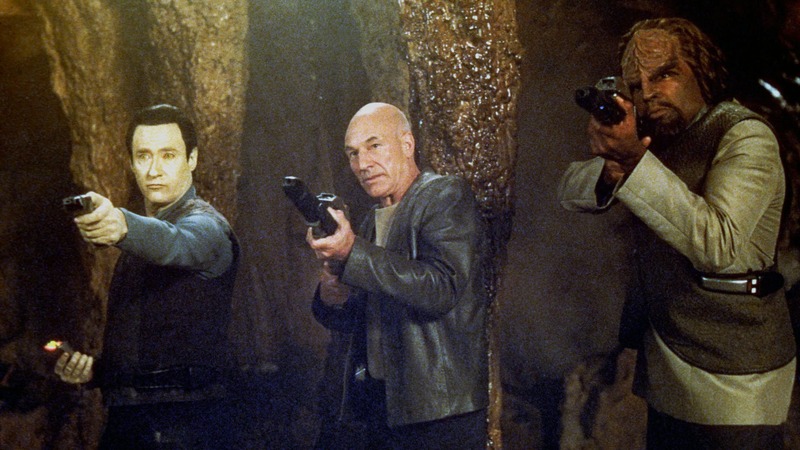 However, the film exists more as a set of individual dramatic set-pieces – the shootouts on the run with the Son’a probes, Picard trapped in a cave-in with the boy, the shootout in the nebula – than it does as a plot. Certainly, some of these are undeniably effective – the aforementioned opening, a cute scene with Picard and Worf talking Data down with a chorus from Gilbert and Sullivan’s HMS Pinafore. There is one scene where the holo-ship and an entire holographic recreation of the village is discovered, which opens up the eerie sense of wonder that a number of Star Trek: The Next Generation stories did exceptionally well – the building from something bizarre happening to a logical, scientific explanation of events – but this is all too brief a scene. The rest of the plotting is disappointingly second rate – cliched villains and shallow politics; things that happen without clear explanation – like Donna Murphy’s ability to still time or why Data goes amok at the start. The story is a disappointingly banal overhaul of the classic Lost Horizon (1937) about Westerners coming among upon a Utopian village in the Himalayas where peaceful living leads to immortality. The climax is dramatically difficult to follow, involving as it does three different ships all converging at once with varying onboard dramas – two ships being about to explode, one undergoing a mutiny, a shootout happening aboard another – and some of Trek’s less-than-credible technobabble sleight-of-hand that involves the bridge crew of a ship being transported into a holodeck simulation of their bridge without they somehow noticing it. The other Star Trek: The Next Generation films are: Star Trek: Generations (1994), Star Trek: First Contact (1996) and Star Trek: Nemesis (2002). The other Star Trek films are: Star Trek – The Motion Picture (1979), Star Trek II: The Wrath of Khan (1982), Star Trek III: The Search for Spock (1984), The Voyage Home: Star Trek IV (1986), Star Trek V: The Final Frontier (1989) and Star Trek VI: The Undiscovered Country (1991). Star Trek (2009), Star Trek: Into Darkness (2013) and Star Trek: Beyond (2016) were reboots of the classic series, which recast the classic roles with new faces. The Star Trek tv series are Star Trek (1966-9), Star Trek: The Next Generation (1987-94), Star Trek: Deep Space Nine (1992-9), Star Trek: Voyager (1995-2001), Enterprise (2001-5) and Star Trek: Discovery (2017– ). (Nominee for Best Musical Score and Best Special Effects at this site’s Best of 1998 Awards).